Christmas busts through the front door like a wild-eyed puppy. Hurry hurry! There are cookies to bake and cards to create and errands to run. We haul the fresh cut tree from the top of the car and string it helter-skelter with white lights, kid-crafted ornaments, and heirloom treasures. It stands, open-armed, like a diva, sending forth her resinous, riotous scent. We drag bundles of spruce, holly and mistletoe home from the farmers market, fill bowls with pomegranates and pecans in their shells. Crimson cranberries brighten breads and sauces, are tossed into salads and onto roasts. 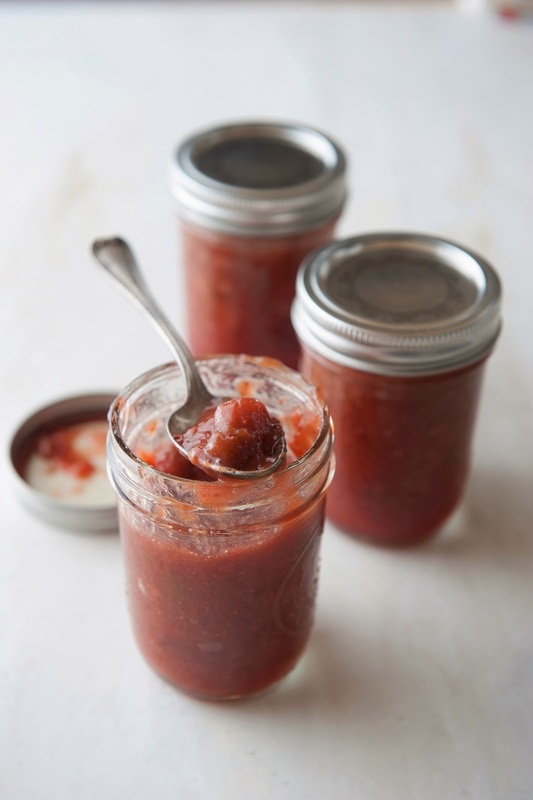 With a little sugar and a bit of love, cranberries make a tangy fresh salsa or chutney. These are pretty on the holiday table, and make wonderful gifts. This fresh, zesty sauce is great with chips, spooned onto roast turkey or pork, swirled into yogurt. Put all of the ingredients into a food processor fitted with a steel blade and grind until finely chopped. Store in a covered container in the refrigerator. A brilliant red condiment for roasts and the cheese plate, this keeps several weeks in the refrigerator. If you plan to process it, follow the instructions on the canning jars. In a large deep pot, combine the vinegar and cranberries and place over medium heat. Add the onions, apples and pears and bring to a boil, stirring constantly. Stir in the sugars, a little at a time so that they dissolve. Adjust the heat and simmer gently for until the mixture begins to thicken, about 30 minutes. Stir in the ginger and apricots. Continue simmering until the mixture is thick enough to mound onto a spoon, an additional 20 minutes, adding a little water if it begins to stick on the bottom of the pan. Spoon into mason jars and allow to cool. Cover and store in the refrigerator.